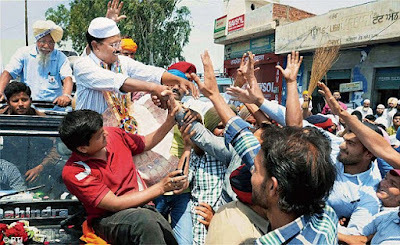 Shimla : In major boost to Aam Aadmi Party (AAP) in Himachal Pradesh, the breakaway group of Himachal Lokhit Party (HLP) which defied the party chief Maheshwar Singh, merged with AAP. The leaders of the breakaway group, including former minister Mohinder Nath Sofat, Working President of the party Subhash Sharma, General Secretary Dharam Chand Guleria announced merger of the party, along with their supporters in the presence of Sanjay Singh who is incharge of AAP in Himachal Pradesh. Addressing media, Singh said AAP would emerge as third force and will contest in all 68 assembly seats in next elections in the state. He also said after the elections in Goa and Punjab the focus of the party would be on Himachal Pradesh and Gujarat. He said AAP has set a target to enroll 10 lakh of members and was confident ofwinning the polls in the state. People were fed up with both the BJP and Congress, and the corruption in the current government would ensure emergence of AAP as a major force, he said, adding that the situation in BJP was no better and people had seen its regime twice in the past during past 18 years. Maheshwar Singh had announced merger of the party with BJP on August 14, but some prominent leaders had refused to fall in line and argued, that they had left the BJP on the issue of corruption and can't rejoin the party.